Last year Capcom baffled everyone with trailers for a downloadable title for the Sony PlayStation 3 and Microsoft Xbox 360 called Mega Man Universe that proposed to mix elements of Mega Man 2 with a level editor and additional playable characters from the Capcom universe such as Street Fighter's Ryu and Sir Arthur from Ghouls 'n Ghosts. Everything went quiet on the Universe front a little while ago, and now today we have confirmation from the company that the game has been cancelled. Dr. Wily wins again. The actual announcement is in Japanese, but the gist of it is that the game has ceased development for "various reasons". Is that nebulous enough for you? Microsoft has faced something of a disadvantage when it comes to the storage capacity of its chosen disc medium for the Xbox 360. Dual-layered DVDs top out at 7.95 GB of space which once upon a time was more than enough for anyone, but times are changing and those DVDs look a little paltry next to Sony's Blu-ray format in use with the PlayStation 3. While Microsoft can't match the 25 GB capacity of a single-layer Blu-ray disc with existing Xbox 360 hardware, it can give its DVDs a little boost. As it turns out, existing Xbox 360 games are limited to occupying only 6.8 GB of each 7.95 GB DVD. That last bit of restricted space is home to video codecs and anti-piracy material. In an appreciated effort to wring every last bit of capability out of the DVD format, Microsoft is about to lift that restriction and allow developers more access to each disc. Eurogamer has the report. The maximum space allocated to game data on the current disc format is just 6.8GB out of a maximum of 7.95GB on a standard dual layer DVD, with over 1GB dedicated to a DVD-Video partition that also contained anti-piracy security sectors. Astonishingly, this meant that the last generation PlayStation 2 had a higher level of raw storage available to games developers than the newer Xbox 360. It seems that this video partition has either been drastically reduced or omitted completely in the new format Microsoft is looking to roll-out. Beta testers of the new dashboard get a free copy of Halo: Reach once they are accepted into the new preview programme. We can assume that this isn't just a generous gift on Microsoft's part - more likely it is a disc pressed using the new format, and Microsoft is looking for data on performance on as many different systems as it can. There is no one standard Xbox 360 DVD drive: the platform holder has used drives from Samsung, Hitachi, Benq and Liteon across the console's five year history. Halo: Reach occupied 6.6GB of space on the old format disc. Either padding or additional content will have been added to this new edition, or it may well simply be the case that the data is allocated into certain physical areas of the disc the video partition would have previously occupied. Microsoft needs to do whatever it can to keep its console feeling advanced as time goes by. All three of the big producers do, really, but it's even more important for Microsoft. More storage capacity (even just an extra 1 GB) leads to more advanced games and more interesting products. Everybody wins in the end. The last thing that the company needs is for its flagship gaming product to start to look tired and worn out before it's time. Just ask Nintendo how bright its Wii future is looking these days compared to several years ago, for instance. If you'd like to join the dashboard beta and score that free technologically interesting Halo: Reach, then just do what Major Nelson tells you to do and sign up via Microsoft Connect. I'll say this for Warner Brothers Interactive Entertainment: when they go all-in on what's wrong with the video game industry this generation, they really go all-in. We already knew that the publisher's upcoming Mortal Kombat for the Sony PlayStation 3 and Microsoft Xbox 360 featured different preorder incentives spread across several retailers. We also already knew that two downloadable characters will be offered for sale shortly after launch. Now we're hearing according to a letter that allegedly went out to key retailers that the game's online multiplayer mode will be locked down with one of those online passes that has become so popular among publishers like Electronic Arts and THQ lately. New copies of the game will come with a voucher required to unlock the online modes, while those who buy the game used will have to kick in an additional $10 to buy a voucher from the PlayStation Store or Xbox Live Marketplace. Those without a pass can also choose to go for a free one-time two-day trial period. Joystiq has the details. At present, WBIE evidently intends to do the same for its high-profile releases F.E.A.R. 3 and Batman: Arkham City. Since the latter won't feature multiplayer, though, the token would have to unlock some other (equally attractive) content. According to an email obtained from our source, which appears intended for retailers, WBIE won't be promoting the pass -- in fact, no reference to it will appear on the game's packaging. Instead, it is apparently providing retailers with details on the pass, including how to purchase a new one if you're buying a used copy of the game. It's pretty low not to mention the pass requirement on the packaging. Online passes are a charged issue, but at least publishers mention the requirement on the box. Keeping it a secret just encourages used purchases from people who may otherwise walk away, and once the game is in your home, are you really going to go to the trouble of returning it versus kicking in another $10 for the pass? Retailers are being provided with details, sure, but I can't say that I expect most GameStop clerks to explain the issue to clueless customers. How bad has the overpriced downloadable content epidemic become in the video gaming industry? Bad enough that the Chess Hero scenario outlined here via Reddit isn't entirely implausible. 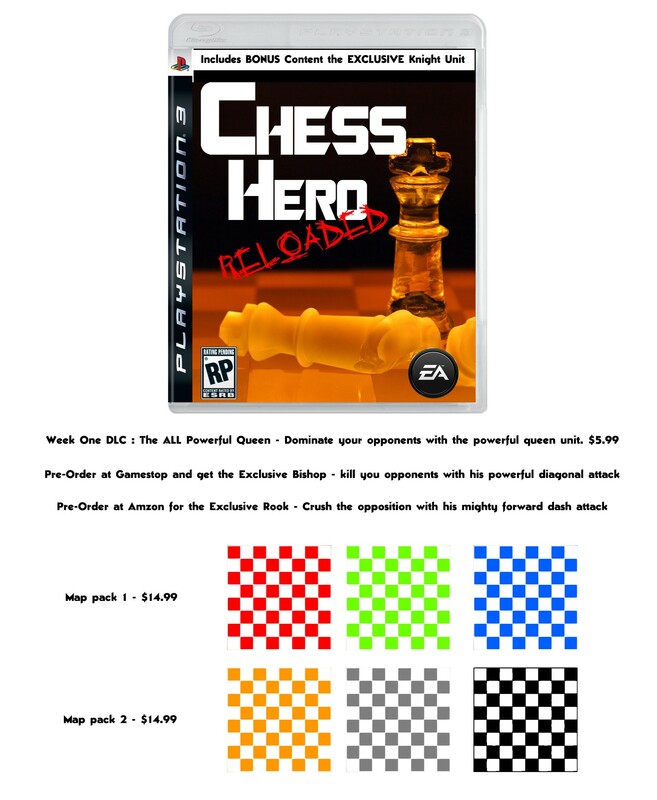 I especially love the brilliance of selling $15 map packs that are just different color chess boards and the fact that the actual traditional board is the last one offered in the second pack. It's not possible to assemble a full board of all chess pieces without preordering all over town, and then there's the unstated implication that buying the game off the shelf without a preorder only allows access to the king, knights, and pawns, and I bet that buying the game used takes the knights out of the equation assuming that they're tied to an Online Pass system of some sort (since they are bonus content, after all). Look upon your grim future and despair! Perhaps you are hesitant to subscribe for some reason or another. Maybe you aren’t sure whether Archie is up to the task, or Dreamwave’s production in the early 2000′s left a bad taste in your mouth. Perhaps you simply have other doubts, questions which need to be answered before you feel secure in handing over your money each month for a dose of Blue Bomber goodness. Worry not! We’re here to help. Until midnight PST on Sunday, April 3rd, we are taking your questions about the comic for the fine folks at Archie Comics, which we will deliver in an interview to be posted soon after. To participate in this, you can e-mail us at the.mega.man.network @ gmail.com with the subject “Archie Mega Man Interview”. I'm curious to see how this comic ends up. I'd love to see something like what BOOM Studios has done recently with its Darkwing Duck revival: appropriate for all ages, but really aimed at today's twenty- and thirty-somethings who grew up with the characters. Is Archie up to the challenge? We'll find out soon enough. We wanted to take this opportunity to thank you for your participation in the PlayStation®Rewards Beta, which is ending on March 31st. Your feedback helped us understand the kinds of things that make you feel appreciated and valued. Based on what we learned, we have decided the program is not ready to roll out to the public in April as originally planned. But rest assured, we will continue to thank loyal and devoted customers like you with innovative offerings. All is not lost though, as Sony will be sending out special PlayStation t-shirts to everyone who leveled up at least once during the beta phase (that is, achieved Select, Pro, or Legendary status). Real t-shirts, too, and not PlayStation Home clothes. Yes, a real tangible object. I think that's the greatest thank-you of all to come out of the program. I do hope that the Rewards program returns sometime, as it was a fun little program that doled out minor virtual rewards for just doing one's usual PlayStation activities. Exactly why the company feels the program isn't ready for the general public is up for grabs, but if I had to guess, I'd say that most people want real objects instead of avatars or Home clothes, and since producing and shipping physical goods costs much more money than sending out online vouchers, the Rewards program that most people would want is not financially feasible at this time. I can't prove that though. It's just my educated guess as a valued Select member (which is a status of membership that will apparently one day have the same cachet as owning a Members Only jacket). Once again the time has come to pause and take note of the previous five hundred entries published here on Press The Buttons. Coming in at a grand total of thirty-five hundred articles, I've certainly kept busy! We've seen a lot come (and go) since we last took stock of the situation back in July 2010. There's been fun with arranged music, some time spent with AJ LoCascio on Power Button, plenty of interesting artwork from a few favorite franchises, a deeper look at the concept document for Aero the Acro-Bat, recounts of how and when I acquired parts of my gaming collection, the arrival and departure of the Press The Buttons video show, and much more. Here are a few of my favorite features that have appeared here since the last time we convened for a recap. Super Street Fighter IV: Arcade Edition Headed For Home? Well the BBFC's page simply lists SSFIV: AE as "digital media". DLC then, rather than a full disc release, a la Super SFIV? Maybe not. You see all versions of Street Fighter IV thus far have been dubbed with the same, catch-all monicker. We haven't managed to get anything concrete out of Capcom so far, but we're expecting a full reveal at the company's Captivate event, which starts next Tuesday, the 6th of April. I apparently have a Street Fighter IV addiction. I just bought Super Street Fighter IV 3D Edition for the Nintendo 3DS. I already own Super Street Fighter IV as well as the PS3 and iPhone versions of Street Fighter IV. If this Arcade Edition is headed to the home consoles as a new stand-alone disc, then I'm done. I'm not kicking out another $40 for yet another version of a game for which I've already demonstrated an ongoing purchasing habit. I have to draw the line somewhere. However, a $10 downloadable content add-on for the Super disc that I already own would be perfect, and I really hope that Capcom makes that option happen instead. A recent survey of Japanese video game developers revealed that a majority of eastern developers prefer games produced in the west (such as Red Dead Redemption and Heavy Rain) to their own creations. What does that say about the state of the industry? After all, the most memorable video games of the past twenty years have been mostly Japanese creations: Super Mario, The Legend of Zelda, Castlevania, Mega Man... the list goes on and on. Has the west taken the mantle of video game innovation from the east? This week on Power Button we gather to discuss the matter and try to figure out how this event came to pass. The result is a fascinating fifty-three minute conversation that analyzes what may have gone wrong in the east and how the west has built upon the other's past successes. Download this week's episode directly from PTB, listen with the player below, or subscribe via iTunes, and be sure to catch up on past episodes if you're joining us late. Remember that you can reach all three of us via and you can even follow all of us on Twitter at @PressTheButtons,@aubradley84, and @JoeyDavidson or for just podcast updates, @ThePowerButton. Next Week: The Nintendo 3DS has entered out lives and we're ready to talk about first impressions. Join us for audio in the third dimension! There is overwhelming support out there for printed instruction manuals, and I'm right there with the crowd on this one. Manuals can do more than explain what the X button does in a game. They can set the stage for the storyline, present short character biographies, spotlight original artwork, and so much more. Now they're being sacrificed for the sake of increased profits in the name of the environment. I hate to see them go, but the writing has been on the wall for a while here. I had a feeling that printed manuals were doomed back when I opened the booklet for Tony Hawk's Underground 2 last generation and found that more than half of the pages were devoted to advertisements. Advertisements in an instruction manual! Now that is a waste of everybody's time. Anything for a buck these days in an industry worth billions, I swear. This week's Episode 43 of the Power Button podcast focuses on an interesting discussion regarding video games developed in the east (that'd be anything from Japan and other parts of Asia) versus video games developed in the west (which is everywhere else). A recent survey of Japanese developers regarding favorite games from 2010 ended in a surprising revelation that a large majority of eastern developers prefer western titles to their own. Which do you prefer? Let's hear your thoughts.